We recommend that you do these exercises under or close to a birch tree. If that's just not possible, as we said in the introduction, visualise a birch tree. 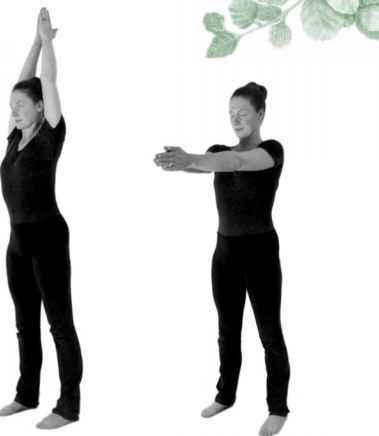 The energy of this tree strengthens the effect of these exercises. a) Slowly dance under or around the birch to some nice, soft music. 1-3 minutes. You could hum, sing, or bring an instrument with you. b) Use your hands to gently say hello to your whole body. c) With your feet shoulder-width apart, bend your upper body backwards, with your arms hanging loosely by your sides. Engage Mulbhand. Breathe long and deep. 1 minute. d) With your feet still shoulder-width apart, let your upper body hang down to the front. Again breathe long and deep. 1-3 minutes. To relax the spine. a) With your feet hip-width apart, hold your arms in front of you at shoulder height. With a wave-like motion, start to move your hands, arms, shoulders, torso, hips and knees. Now stand on your toes and swing your arms backwards making a circle, and then forwards again. 1-3 minutes. To loosen and energise. With your feet still hip-width apart, crouch down, keeping the soles of your feet flat on the floor. Stretch your arms straight out in front of you; knit your fingers together and point your forefingers. Keep your upper body vertical and breathe long and slow. 1-3 minutes. 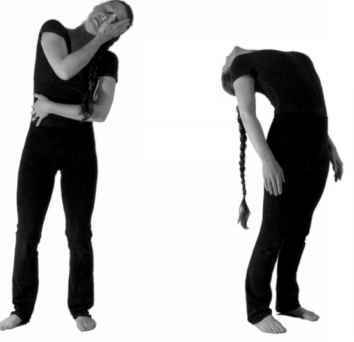 The crow posture works on the large intestines, which are psycho-somatically connected to our ability to let go. The forefinger holds the energy of Jupiter, which is associated with being positive. If you need to, you can put a piece of wood under your heels so that you make contact with the whole of your foot. c) While standing, bend down and hold your ankles; now start to walk around while keeping your legs straight. 1 minute. This stretches the back of your legs, while giving you an unusual perspective of the world. A slight variation would be to place your hands around your knees or calves.